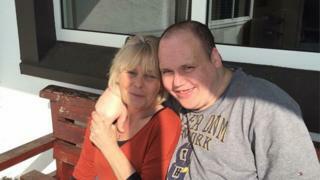 The mother of a man with learning disabilities has said Muckamore Abbey “doesn’t deserve to be called a hospital”. Anne Blake commented after her son, Jonathan, became seriously ill while living in Muckamore, County Antrim. Mrs Blake said Jonathan’s medical health was not taken seriously because of his learning disability. The Belfast Trust said it takes the issues raised by Jonathan’s family very seriously. The trust also said that following an investigation a report has been sent to the Blake family. The report into the investigation has been seen by the BBC. Muckamore Abbey provides care to about 80 patients with learning disabilities or behavioural problems. Jonathan, 36, was detained there under the Mental Health Order in December 2015 because of his worsening epilepsy and challenging behaviour. Before then he had lived at home with his parents where, his mother said, he had enjoyed a good standard of life. While an inpatient his mother became alarmed by his weight loss. Jonathan also developed a problem with one of his eyes – Mrs Blake said neither condition was dealt with properly. “He went into Muckamore and weighed 22 stone. He lost six stone and was getting weaker and weaker,” she said. “I continually complained about him losing weight. It was obvious he was a very ill person and he wasn’t being treated as an ill person. “He took a really sore eye and I had to actually insist that he was seen. His mother said that Jonathan was eventually treated for lymphoma by the haematology team in Antrim Area Hospital. During a visit to his family home in August 2017 he became acutely ill and was taken to the stroke unit in Belfast’s Royal Victoria Hospital, where he was to remain for nearly a year. Mrs Blake also complained the hospital failed to treat her son with “dignity or respect”. “It’s a case of out of sight, out of mind. When Jonathan left Muckamore and was in the RVH my husband found a black rubbish bag sitting outside his room and when we looked into it it was Jonathan’s bits and pieces of clothes. Jonathan is now living in supported accommodation but is in a wheelchair, is incontinent and requires personal care. His family maintain that while he was in Muckamore his health was neglected and say that the culture in the hospital is not suitable for ill people. “I think if they are compliant, are easy to manage and they maybe have been there for years and years – there’s a routine. “But if somebody comes in new, or somebody comes in who actually has challenging stuff going on or really ill like my son was, there is no care. Mrs Blake complained to the Belfast Trust about her son’s care in Muckamore and after an investigation the trust drew up a report. Ensuring patients and relatives are referred to appropriate professionals when necessary. In a statement to BBC NI, a spokesperson for the Belfast Health and Social Care Trust said a complaint had been made regarding Mr Blake’s care while he was an in-patient in Muckamore Abbey Hospital.